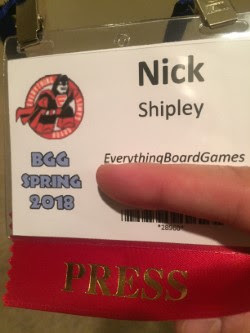 Over Memorial Day weekend, I got to attend BGGCon in Dallas, Texas. This was my first board game convention, and it did not disappoint. The event was a whirlwind of meeples and 5-Hour Energy drinks, and I loved almost* every minute of it. The amenities were great, the volunteers were very helpful, and the other attendees were quick to play and/or teach - I cannot say enough good things about the experience. (From the publisher) - Welcome to the Rococo era during the reign of Louis XV when it's safe to say that holding lavish balls is quite trendy. Important personalities wrap up in noble coats and dresses, anxious to outshine one another. As the biggest event is coming up in just a few weeks, everyone is turning to you with their requests: an elegant coat here, a stunning dress there, or a donation to fund the fireworks at the event. Soon you realize that it's not just about your dressmaking business anymore – it's about managing the most prestigious ball of the era...and now it's time to rock! Rococo is a two hour game about sewing dresses. Do with that what you want. I waffle between "theme is very important" and "theme isn't important at all" more than I would like to admit, so take this with a grain of salt. For those unfamiliar, or those that didn't read the italicized text above, Rococo is a two-hour Eurostyle game about sewing dresses and fancy coats for a ball. Though the theme was a pretty big barrier for me to overcome/ignore, the mechanics are smooth, and the time goes by faster than I would have guessed. It wasn't a terrible game (I've played a lot worse in terms of gameplay and theme), but outside of one of the members of my game group requesting that we play it on their birthday, I probably won't revisit it. This definitely falls into the "not for me, but maybe for you" category. (From the publisher) - In the most distant reaches of the world, magic still exists, embodied by spirits of the land, of the sky, and of every natural thing. As the great powers of Europe stretch their colonial empires further and further, they will inevitably lay claim to a place where spirits still hold power - and when they do, the land itself will fight back alongside the islanders who live there. I really enjoy co-op games and was happy to get a chance to play Spirit Island. This game takes the trite theme of exploring some uncharted exotic land to reap the rewards by exploiting its commodities, and it flips it upside down. In Spirit Island, colonization isn't the goal, it's the problem - and you're the solution. This game was good across the board - mechanics, theme, difficulty, all of it. It has a strong Pandemic vibe, but I think there would be room on my table for both. I would play this again if given the opportunity. (From the publisher) - On the hunt for priceless treasures, groups of adventurers explore the legendary temple at Luxor. Their ultimate goal is the tomb of the pharaoh, but many treasures can be collected as they search. As they explore, the challenge unfolds: The player who manages to quickly get their team of adventurers to the tomb, while salvaging as many treasures as possible, will be the winner. I really didn't know much about Luxor other than that it was a 2018 Spiel des Jahres nominee, but that alone was enough to entice me to play, and I am glad I did. Luxor was, quite simply, fun. I enjoyed playing it, talking about it afterwards, and even thinking about it now. That being said, I think it would be quite the upset if Luxor were to win the SdJ, so it will probably have to settle for the honor of being nominated. But for me, it is one of the few that I played that I would list as worthy of purchase. (From the publisher) - Castell is a strategy game in which players guide castell teams through a year of festivals. Visit Catalan cities, expand your team of castellers, learn tower-building skills, and show off your tower-building prowess at local performances and festival competitions. Castell has people tower-shaped meeples. For those that don't know (I didn't until this game came out), "castell" is a Catalan tradition of building human towers. You read that right. Human. Towers. So in short, this is a tile-laying game about stacking people. 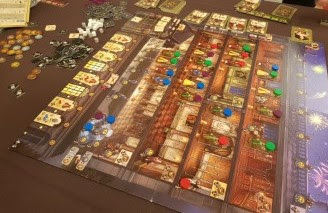 I feel a bit like I am talking out of both sides of my mouth when I disparage Rococo for having a unique theme while also giving Castell a pass for the same thing, but in my mind, the difference is in the game mechanics; Castell falls more closely in line with the type of game I enjoy (pattern building, set collections, tile laying) versus the type that are really aren't my thing (heavier Euros). And because of that, I'm more willing to go along with a quirky theme when it is accompanied by mechanics I enjoy. Overall, I liked Castell, but I didn't love it. I would be willing to play it again, but if I were to purchase it, it would have a hard time competing for table space against other Renegade titles. 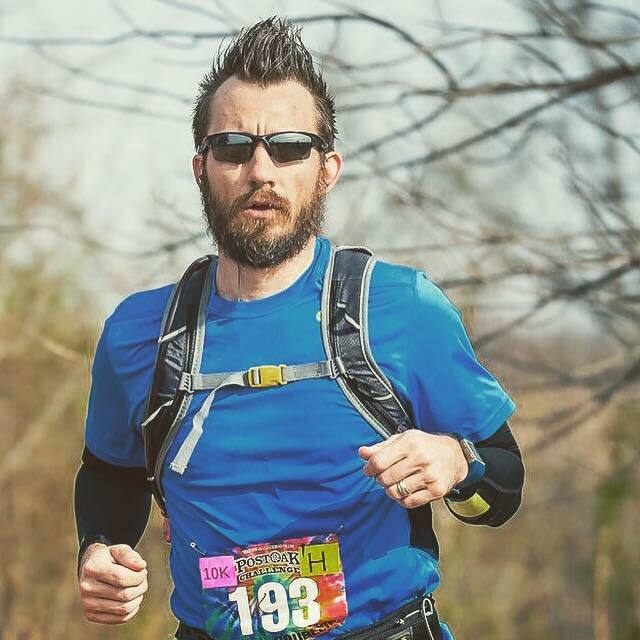 (From the publisher) - The Mind is more than just a game. It's an experiment, a journey, a team experience in which you can't exchange information, yet will become one to defeat all the levels of the game. In more detail, the deck contains cards numbered 1-100, and during the game you try to complete 12, 10, or 8 levels of play with 2, 3, or 4 players. In a level, each player receives a hand of cards equal to the number of the level: one card in level 1, two cards in level 2, etc. 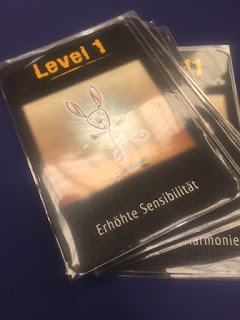 Collectively you must play these cards into the center of the table on a single discard pile in ascending order but you cannot communicate with one another in any way as to which cards you hold. Level 1 of The Mind, titled "Increased Sensitivity" (according to a quick Google search). (From the publisher) - Choose your dice well in Ganz schön clever to enter them into the matching colored area, put together tricky chain-scoring opportunities, and rack up the points. The dice you don't use are as important as what you do because every die that's smaller than the chosen one can be used by the other players, keeping everyone in the game at all times. Clever lived up to its name. Warsch appears to be having a great year, having struck designing gold with both 2018 Spiel des Jahres nominee The Mind and 2018 Kennerspiel des Jahres nominee Ganz Schon Clever. I got to play them both, but let's start with The Mind. There was a lot of hype surrounding The Mind, and it lived up to it to some extent. 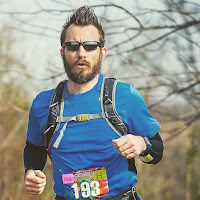 The Mind created a real stress among some of the participants that I have not seen created by any game prior, to the point that the stress seemed to be more of a mechanic of The Mind than a byproduct. Players sitting, hands frozen with a single card raised, just staring at each other waiting for the other to make a move towards the center of the table. It was different, and it was fun for a few games, but it just didn't have the hook I was expecting. I am normally the type to continue to play something until I win, but after four tries and not getting any further than round 6, I had my fill and was ready to move on. The Mind is ultimately a one-trick pony. That one trick may be the creation of stress on a scale hitherto undreamt of in a cooperative card game, but it is one trick nonetheless. That being said, I'll go on the record and say that due to its ability to evoke such a powerful response from its players, I think it will win the 2018 SdJ over Azul, even though I think Azul and Luxor are better games. As for Ganz Schon Clever, it was the only game of the weekend that I played, and then later revisited, and then revisited again to teach to others. 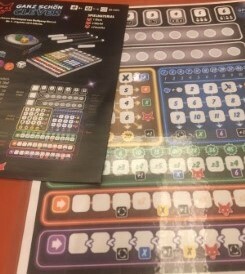 I am not a huge fan of roll and writes, but this is a good game. It has a great balance of luck and strategy. In my mind, Clever is better than The Mind, though I wouldn't be surprised if both emerged victorious when the recommendations are announced. (From the publisher) - As the saying goes, "He who rules the skies…rules at building airplanes and blimps and things." And the whole world is racing to be #1! The small nation of Crumplehorn, scared of being left behind by its rivals, looks once again to Master Pennington B. Knickernacker to save the day. And he’s more than eager to help! Reports say the eccentric businessman, an avid plane enthusiast, is secretly devoting his substantial financial resources to build a fleet of flying machines that surpasses all others. But does he work for the glory of king and country? Or to line his own pockets? No one knows. Planecrafters inspired me to get artsy with my iPhone camera angles. 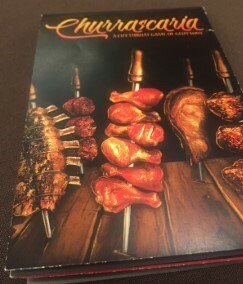 (From the publisher) - Churrascaria: A Cutthroat Game of Gluttony is a fast paced game of card collection where everyone is trying to eat all the succulent meats that appear on their plates while avoiding the equally delicious but ultimately less satisfying sides and desserts that just get in the way. All the while food theft, plate swapping, and general backstabbing keep the food flying. The person who consumes the most meat wins. 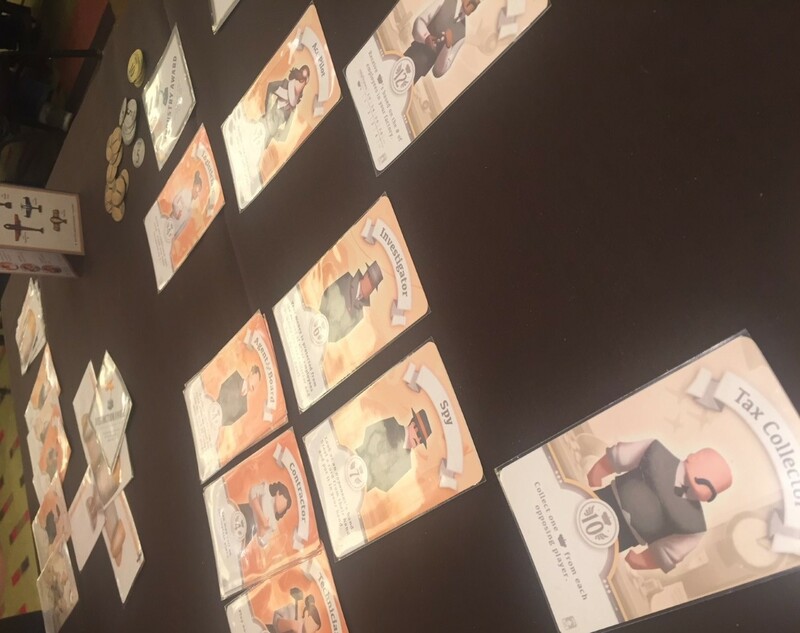 I had the privilege of playing two games still in various stages of production: Planecrafters, which is scheduled to hit Kickstarter sometime in June, and Churrascaria, which recently funded on Kickstarter (but is still taking pre-orders). Plancrafters is a simple hand-management game. 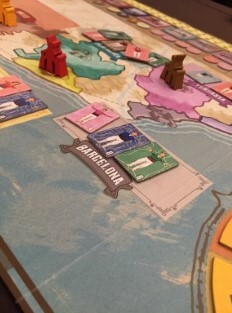 Players hire workers, build planes, and sell them for victory points. It took about five minutes to get from instructions to playing, and it even though it is technically a review copy and "all art and components are subject to change, etc., etc.," it is a good looking game. The art has a kind of an aviation-meets-Art-Deco vibe in these sepia tones that just popped off of the table. It was the type of game that made people do a double take as they walked by the table. Though the gameplay is simple, it was still a challenge to chain the abilities of the workers together to maximize production and profit. It is a filler, but I don't mean that in a bad way, as it was a good game to end the night on. Churrascaria is a take-that game about meat and eating as much of it as you possibly can. 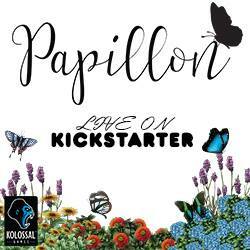 I had followed the initial campaign and subsequent relaunch closely, but I had not had any experience playing the game. I was pleasantly surprised with the gameplay. Players have to manage what's on their plates (meat vs. anything else), their stop/go notification for the waiter, and all the while being mindful of how to best sabotage their neighbors' meat-eating binge fests. It is very much a back-stabbing game, so if that is not your cup of tea, you may want to look elsewhere. But, if you like a quick-playing, take-that card game, this will satisfy your appetite. Boom. See what I did there? 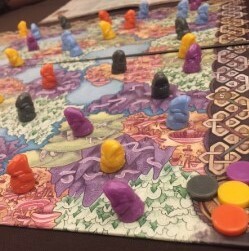 (From the publisher) - In Fae, first released as Clans, each player is trying to achieve victory by scoring as many points for their color as they can. This is tricky as each player's color is chosen at random and kept hidden until the end of the game. This is Fae - look at it, remember it, play it. Fae is by far my pick for best game of BGGCon. 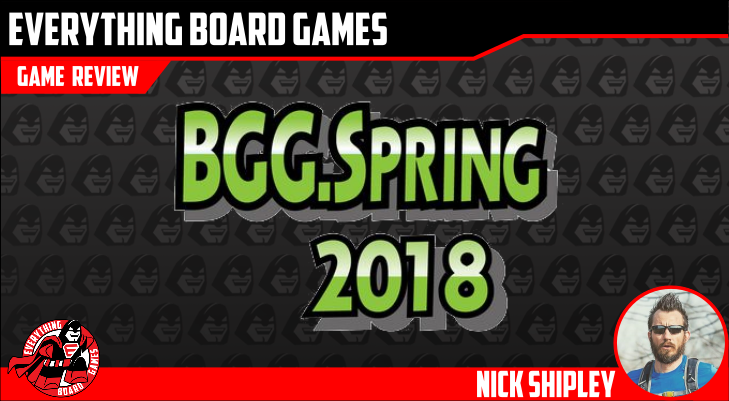 A bluffing/deduction abstract strategy game? Sign. Me. Up. This game landed squarely in the middle of my wheel-house, and it is a game that I could see myself enjoying as much in five years as I did five days ago. I went to the vendor section after playing and was trying to buy a copy (they didn't have any for sale) - it is that good. 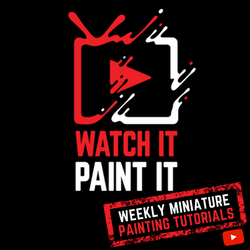 In Fae, players are moving druid miniatures around the board in an attempt to score points for their color, but none of your opponents know what your color is, so you have to bluff and measure losing a battle or two in an effort to win the war. This is a very enjoyable game with enough theme to keep the thematic-minded gamer interested while playing an abstract game. It is a really good game and scratches so many parts of my gaming brain. This is a buy for me, and I would recommend trying to get it to your table at least once. That's it. I had a lot of fun and played a lot of games, and I hope that both of those showed through in this post. 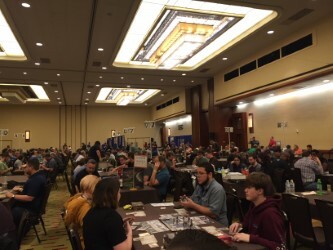 I owe a debt of gratitude to Everything Board Games, Board Game Geek staff and volunteers, my wife, and Dallas - thank you all for helping make this weekend possible. Until next year (or the fall, if I can score some tickets). 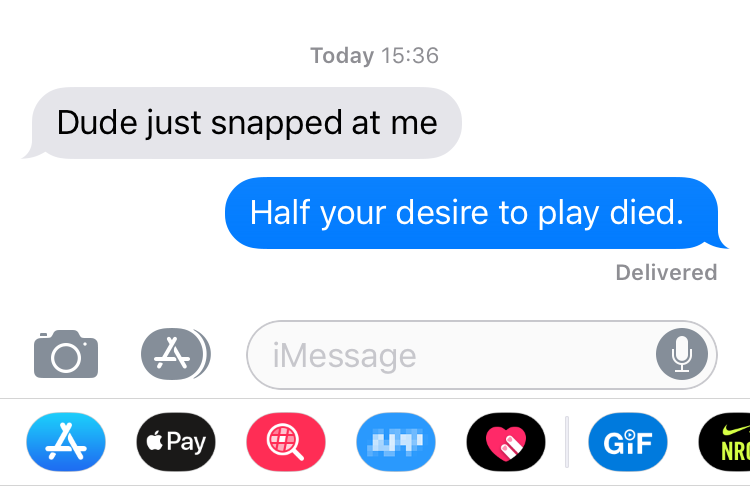 If the joke is lost on you, stop what you're doing and go see Infinity War. But more importantly, remember to be patient at the table and keep it fun for everyone.